There are a handful of sports cars which have been staples of the American gearheads’ diet for decades. The big ones being the Ford Mustang, the Dodge Challenger, the Chevrolet Corvette, and the Chevrolet Camaro. 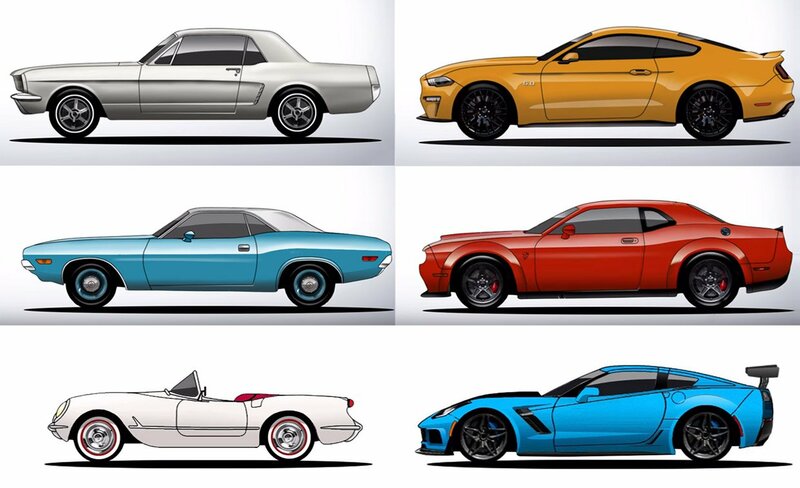 Each of these cars has followed a unique path of evolution throughout its history, sometimes paying tribute to their heritage, while other times trying to reinvent its looks and capabilities for a new generation. Fans of the first three cars on the list can now see a visual history of each of the cars thanks to the YouTube channel Cars Evolution. They put together a series of videos, each of which showcases the changes in these cars over its lifetime, including their major design changes, cost, and engines. While the modern day Mustang and Challenger still pay homage to their ancestors to a certain extent, the C7 Corvette bears virtually no resemblance to its great, great, great, great, great, great granddad. The videos are pretty great, though there are a couple of minor issues, like the 1968 Corvette being a C3 and not a C2. Check out all three clips below, and subscribe to the Cars Evolution channel if you’re interested in future episodes.